The transportation network in Kolkata is well-developed and visitors should have no difficulty getting around. Travel between districts is possible by bus, taxi, hire car or the metro, while long-haul transport is mainly accomplished by coach, train or plane. 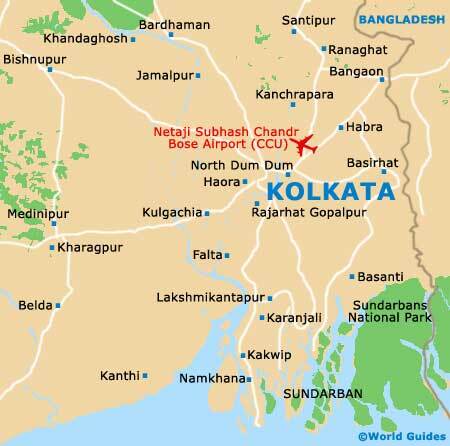 Kolkata's Netaji Subhash Chandra Bose International Airport is located around 19 km / 12 miles to the east of the city centre. This local airport is one of two international gateways in West Bengal and ranks as one of the busiest transport hubs in all of India. Netaji Subhash Chandra Bose International Airport handles well over eight million passengers on an annual basis, making it the fifth-busiest airport in India. Flights connect all over the subcontinent and throughout Greater Asia. Beyond this, Air India conducts services to London Heathrow and New York JFK airports. The best way to get from the airport to the city centre is with a prepaid taxi. It is also possible to travel by rail or Volvo bus. Private cars are available for hire at the airport, but they are also widely available from small shops in the city centre. Most rental agencies insist that you hire a driver with the car, which is wise for Western drivers who aren't accustomed to the local rules of the road. Chartering a driver is inexpensive, and the peace of mind afforded is completely worth the extra expense. A car and driver may also be hired for excursions into the neighbouring West Bengali countryside districts of Murshidabad (north), Bardhaman (west), Hooghly (south-west) and North 24 Parganas (south), amongst other destinations. Book your Kolkata Car Rental here. Locals use buses to get around Kolkata, and this is the cheapest, if not the most comfortable, way to travel around the city. Routes are clearly marked on the outsides of buses, with both English and Bengali signage. For long-haul journeys, the bus stand in the Esplanade area operates routes all over West Bengal. 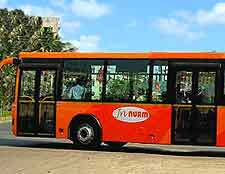 It is also possible to arrange bus transport to Dhaka at the Bangladeshi border. 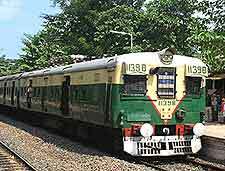 Train transport departs from two major railway stations - Howrah and Sealdah. The majority of long-distance rail travel launches from the former, although Sealdah does operate a line to Delhi. Most trains carry a tourist quota, which usually means you will be able to get a seat on relatively short notice. Tickets are available online or in person at the Foreign Tourist Bureau. Payment is in US dollars or British pounds. Of note, there is also a single metro line in Kolkata, which was actually the first underground subway train network in India and links the northern and southern sides of the city, running between 08:00 to 21:45 Monday to Saturday, and from 14:00 to 21:45 on Sundays. Clearly marked yellow taxis are relatively affordable. Prepaid taxis can be chartered from the airport or Howrah Station. Fares are otherwise calculated according to the meter. Be advised that rather than update their meters, drivers officially adjust their fares by a predetermined factor. Don't be alarmed if asked to pay two or three times as much as the meter reads, as this is not a scam.